I do have something to share with you today :) A few weeks ago I was looking through my completed cards and couldn't find a card I had made for someone (I did eventually find it). I was so frustrated and thought I better get these cards organized. I took one of my Ikea boxes and made dividers for each of the type of cards I have pre-made. I used "From my Kitchen" Cricut cartridge to make the dividers. I don't have the exact dimensions, but basically I measured the width and depth of the box and used my Gypsy to cut them. Thanks for sharing ~ you have the BEST ideas! 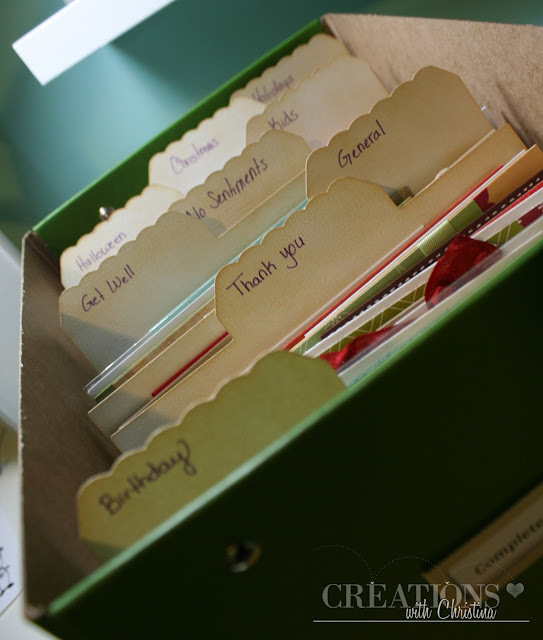 Love the idea and need many, many more so I can get this mess organized without spending a fortune! Great idea. The dividers are so cute. Thanks. Love it, I need to make one of these! Thank you for the great Idea!!! Have a blessed day!